A hutong is a traditional Beijing home with a central courtyard open to the sky. An extended family can live in the multiple rooms surrounding the central area. Beijing used to have hutongs all over but many of them have now been replaced with housing that is more comfortable and efficient, but considerably less charming. There are still some hutong neighbourhoods left though, particularly in the area of Beijing's Bell Tower and Drum Tower, so that's where we decided to go. The front door is a traditional-looking one. Even centuries ago, a hutong inn would have a painted entry gate like this. The problem is finding the entrance! Beijing's hutong neighbourhoods have tiny streets, not very amenable to car traffic. You can see a number of taxis parked there, but I think that's because the drivers live there. Taxis are not happy about going into these places because, as you can see on another of my pages, these narrow streets very easily get clogged. Anyway, to get to this hotel you have to take the main street in front of the Drum Tower east to Baochao Hutong. The taxi will let you out there. Walk north up this hutong to the second hutong on the right. Look for the little red "Hotel" sign on the pole. 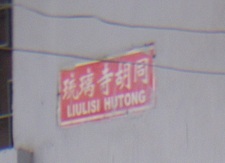 When you see it, turn around and you'll see a hutong street sign as you see on the right. Go east on Liulisi Hutong for about 150m and the hotel is on your right. On the Google map above, the two white dots in the middle are large umbrellas in one of the courtyards of the hotel. Zoom out four notches (click the [-] button) and you'll see the Drum Tower and Bell Tower to the southwest. Zoom out 2 or 3 more notches to see the Forbidden City and Tiananmen Square at the middle bottom. The hutong inn door is, as you see here, just past a public bathroom. 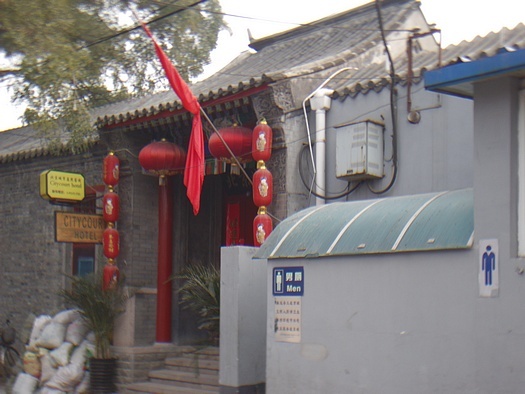 These public bathrooms are all over the hutong neighbourhood northeast of the Beijing Drum Tower and Bell Tower. I suppose that's because these houses were built long before central plumbing was available. It is not an attractive tourist feature of the area but before you complain, keep in mind that the hutongs here are people's homes and they need these. Go through the door and you'll see an entryway with some old-looking art. Through one more door (what we're looking back at in this photo) and you'll see the reception area. Although its website claims it "was built in the middle period of the Qing Dynasty, so it has more than 300 years long history", the Citycourt Hotel is a newly reconstructed hotel. As you can see, the front desk has computers and so on. The staff are all quite friendly. This young woman was enthusiastically talking about her needlepoint work. 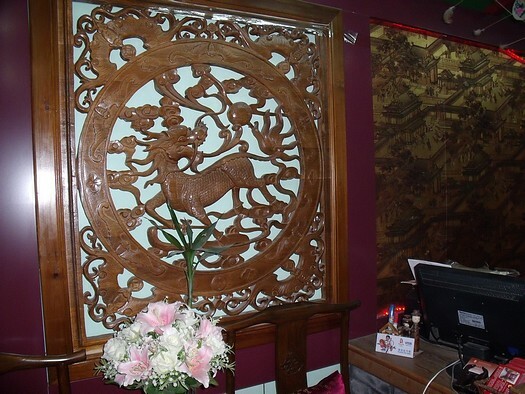 This wooden carving on the wall beside the reception desk intrigued me. It has elements of a dragon, a horse, and a lion. 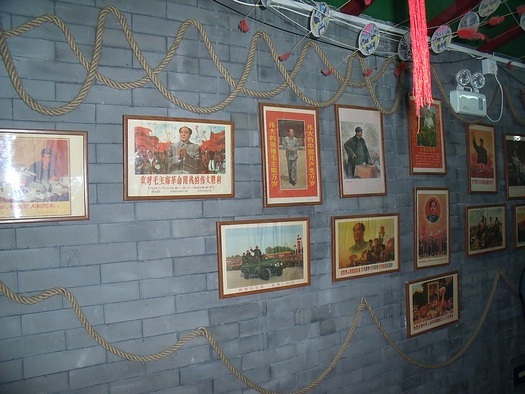 On the wall opposite the reception desk is a collection of photos of Chairman Mao. It's kind of kitschy but hey, it adds to the flavour of the place. 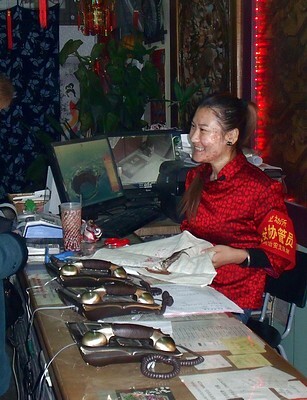 Proceed past the reception desk and you're actually in the hutong inn. Be careful not to step on Terry, the resident turtle. 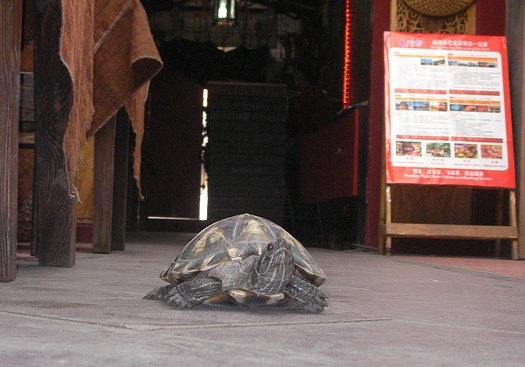 Here he is crawling through the small restaurant area. That area also has a lot of tourist info and a couple of Internet terminals. Computers? In a hutong inn? Just go with the flow. If you wanted totally old style, you'd end up using chamber pots and have no hot shower. The Citycourt Hotel, even there has been one there for 300 years, is a newly built (or heavily renovated) version in an old hutong inn style. I prefer my modern comforts with the old-style atmosphere. Just past Terry and the restaurant take a right turn through a small doorway into the hutong courtyard. 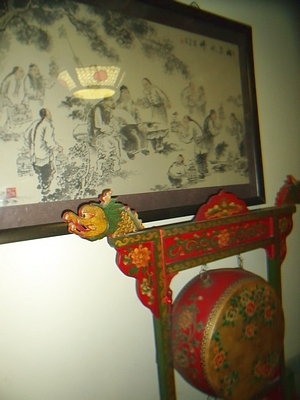 Click here to see the hutong courtyard and hutong inn rooms. 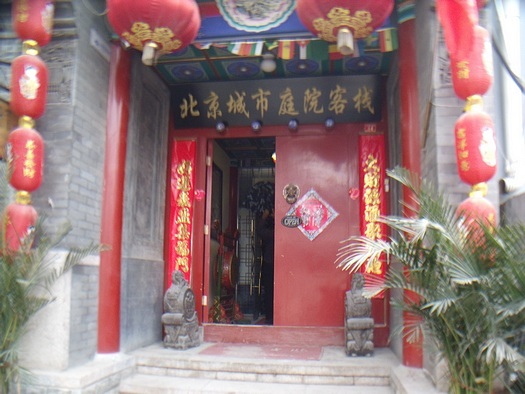 See a hutong's courtyard and rooms. Return from Hutong Inn page to Chinese Places overview page.